From left: Hailey Stephenson, Will Woodland, Michal Parris. Not pictured: Marc Gonzalez. 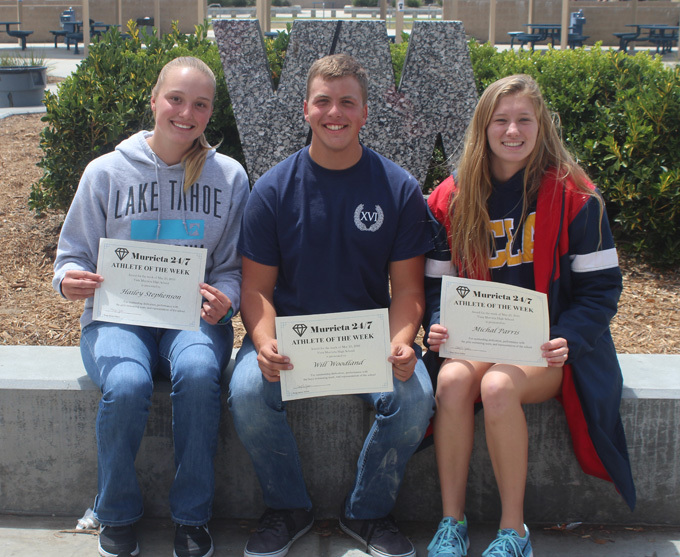 Three senior captains of the Vista Murrieta swimming program have completed their careers and will be honored at the team's awards banquet. "They led our team with class and a lot of heart," said their coach, Cathy Morse. Michal Parris of the girls swim team competed in a variety of events this season but specialized in the 500 free style and 200 individual medley. "I think the highlight of my season was the Iron Man Relays," she said. "I wanted to finish strong but I wasn't looking to be the top in everything. I liked the bonding experience that meet gave us. The events were all relays." Hailey Stephenson specialized in the 100 breaststroke "but I filled in anywhere coach needed me to swim," she said. "I just loved spending time with the JV team and varsity team, cheering them on and helping everyone get ready for the meets." Will Woodland swam all the relay races and competed in the 100 butterfly, 100 breaststroke and 200 IM this season. After graduation, he is joining the Air Force. Marc Gonzalez had three hits in the Bronco baseball team's 6-1 win over Aliso Niguel in the first round of the playoffs May 20. The team finished the season with a 21-11 record. This is the final Athlete of the Week story for the school year. Congratulations to all the Vista Murrieta High School athletes who were honored by Murrieta 24/7 this year.